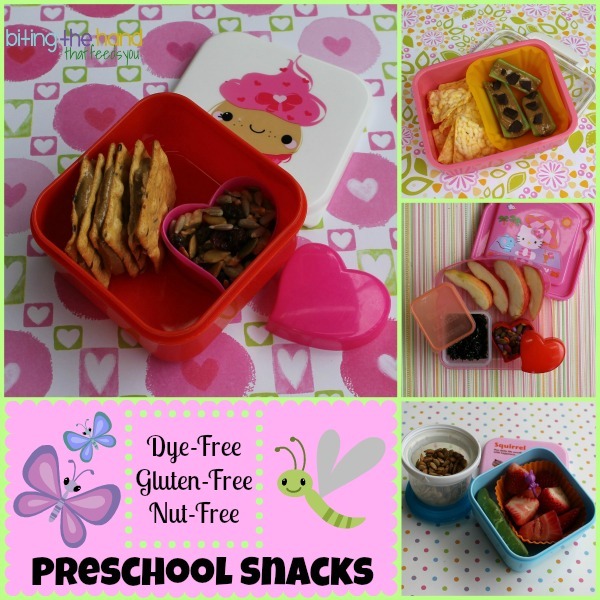 The previous Friday, Little Z's afternoon preschool had a "Parent's Night Out," and I had sent a GoPicnic Sunbutter and Crackers Ready-to-Eat Meal as a nut-free option for her dinner, in case she didn't want the fruit and hot dog (no bun) they had on offer. Or in addition to. She had them open everything, but only ate a little of each. 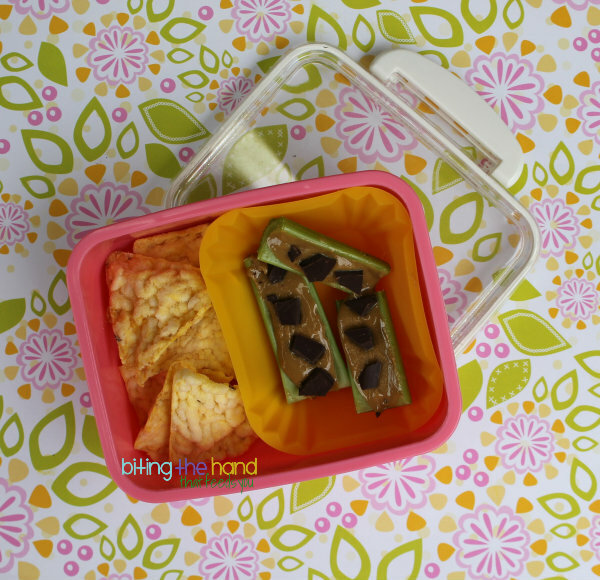 So these are some of her leftover Crunchmaster crackers with Sunbutter and leftover Enjoy Life trail mix. The cupcake box came from Paperchase, in England, so good luck with that. But the little heart box came from Dollar Tree around Valentine's Day. Z loves dried seaweed, but hasn't been as big a fan of the crumbles. I got these from my May foodie penpal and put them in an EasyLunchboxes Mini Dipper to keep them air-tight and dry. The PopCorners came in my April gfreely.com box. I put the nut-free Ants on a Log (with dark chocolate chunks instead of raisins - helloooo!) in a yellow divider cup. I love these things. 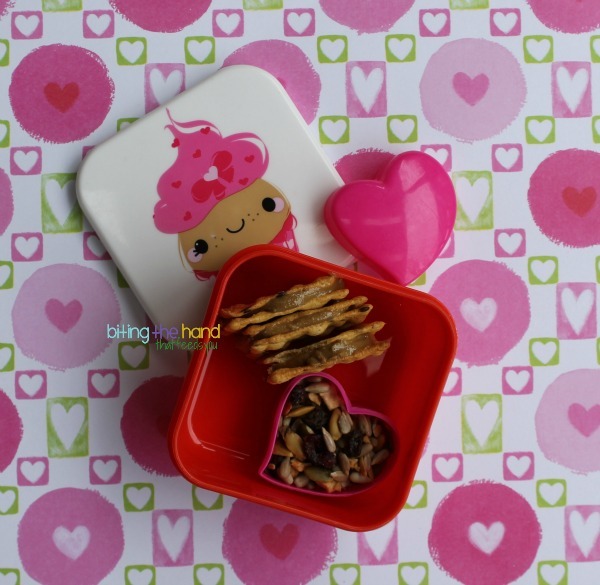 All in a pink snack bento box. 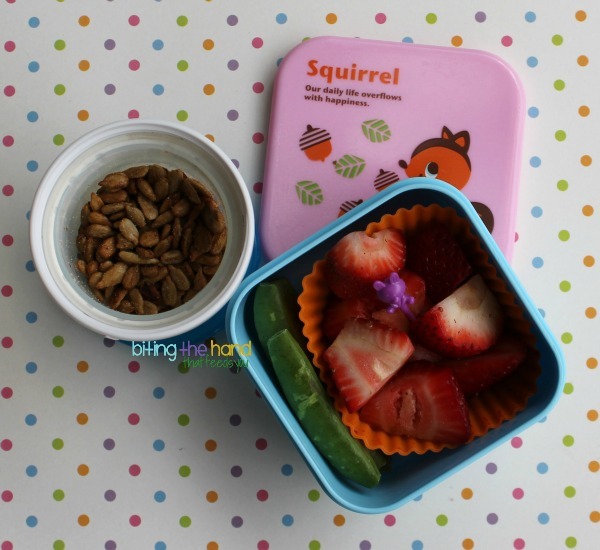 I put the NatureBox BBQ Sunflower Seeds (she LOVES them!) in a little baby food freezer jar from a set by Munchkin. Soft-bottomed, and easy for her to open! They don't rest on their bases very well though. Just for fun, I stuck a purple bunny pick in her strawberries. I put her berries and peas (HA! Wishful thinking on my part!) in a base from a blue pig box but with a lid from a mini squirrel box. 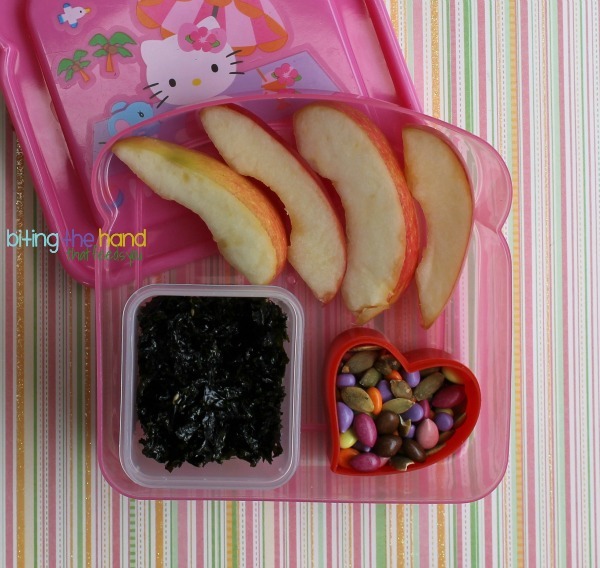 If you saw my bento stash, you would understand how hard it is to find matching lids and bases!